Teaching a puppy to learn its name, otherwise known as teaching them name recognition, is one of the most important lessons your puppy will have to learn early on. Making sure that your puppy is able to reconize its name and respond when you call is important for several reasons. For one, it is the basis of all other training and obedience since you need to have your dog’s attention to successfully give it a command. Name recognition is also important because if a dog runs away you should be able to easily call them back. This is important for safety purposes so your dog doesn’t run into traffic or get lost. Teaching a puppy name recognition is relatively simple, but there are a few bad habits that you need to avoid as an owner that can derail the process if you aren’t careful. Choosing a puppy name can be a lot of fun but here are a few simple guidelines that will name the name learning process a little bit easier. Choose a name that sounds happy and one that preferable has two syllables. This will make it easier for the dog to distinguish their name from a command that is usually one symbol, like “Sit!” or “Stay!”. Also, make sure that it isn’t something too long, complicated, or difficult to pronounce clearly. When the puppy is awake, paying attention to you and not something else (like food or a toy), start your training sessions. It can help if they have a collar or dog leash on at first so you can gently keep them from leaving or trying to jump up during training sessions. Don’t try to force these training sessions when your puppy is tired or not interested or they will think of them as negative and learn not to enjoy them. Start by saying your dog’s name and when he looks at you say something positive like “Yes!” or “Good” and give the puppy a treat. Remember to only say their name one time, and if they don’t look get their attention with the treat right away and praise them when they turn to you. Always remember to give positive reinforcement right away because if you wait they won’t associate the treat or praise with their name. Also, remember to only say their name when you are trying to get your puppy’s attention because adding other words will be confusing. You want to repeat this process several times a day until your puppy starts to get it, which is great because these training sessions are good for bonding. Keep each session short so your puppy doesn’t get bored and try not to use the puppy’s name too much or it will become white noise. Make sure that you always use a happy, positive tone of voice when calling your puppy. You don’t want your puppy to associate their name with negativity or they will learn to ignore it to avoid punishment. Once your puppy has gotten used to looking when called, start to gradually do these training sessions in other environments. Try it in different rooms, while the puppy is in another room, while you’re outside, on walks, and anywhere else you can think of. When they are used to recognising their name in different environments you can take it a step further by adding more distractions, like throwing a ball and then calling your puppy’s name. Treats are a great starting point for catching a puppy’s interest and giving them motivation to learn their name. Once they are pretty good at it, you are going to want to gradually reduce the amount of treats you give them during training sessions and just rely on praise. Dogs are usually driven to please their owners and will enjoy training intrinsically. 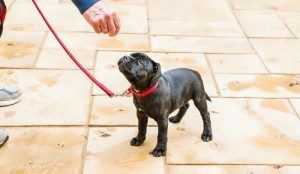 You don’t want your puppy to expect to be given treats every time you use their name forever, so make sure this stops once you move onto other types of training like sit and stay. You will use treats while training dogs to do other tricks too, but in the same way gradually reduce the use of treats and switch to positive reinforcement. Teaching a puppy its name is relatively easy but it takes patience and consistency. All you need is short but frequent training sessions, to keep things positive, and to make sure you are being clear and consistent. If you do these things, your puppy will learn its name in no time. Were you able to train your puppy his name? Tell us in the comments how you did it.